Baking bread doesn’t get much easier (or more fun) than this. No messing with yeast, no kneading, no rising time. And you get to use beer in it! So this bread smells delightful when baking—and tastes deeply delicious when you bite into it. Even people who don’t like beer love Beer Bread. 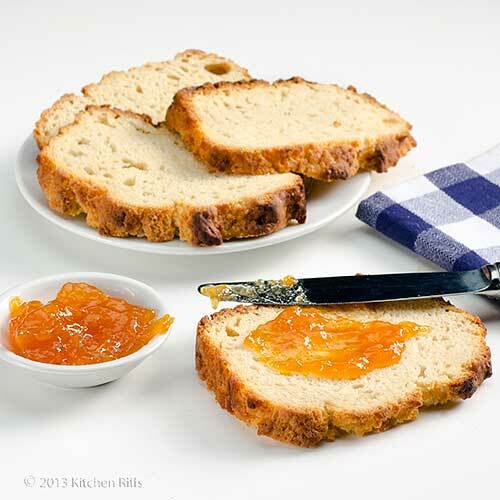 Best of all, this bread is equally tasty for breakfast toast or a mid-day sandwich. Really, can life get any better? 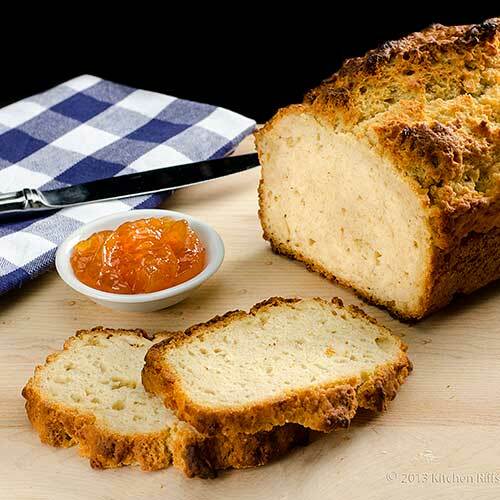 Many quick breads get their rising action from baking powder, not yeast. And that’s how this recipe works. Although beer is made with yeast, most commercial beers don’t contain living yeast organisms (many commercial beers are pasteurized, which kills yeast cells; even when they’re not, the yeast generally is filtered out before bottling). So it’s not yeast from the beer that makes this bread rise. Instead, the beer is there to provide carbonation (which helps fluff up the bread) and lots of flavor. The beer you select does make a difference in the final product: a light-bodied beer will produce a bread with a lighter flavor than, say, a dark beer or stout. In the past, I’ve baked plenty of bread, but nowadays Mrs. Kitchen Riffs is the bread baker in our household. She adapted this recipe from one a relative gave her years ago, with help from the Internet. Mixing time for this recipe is about 5 to 10 minutes, baking time about one hour. So you can be eating this bread in under 1½ hours. Beer bread will stay fresh for a few days when stored at room temperature in a sealed plastic bag. Or freeze it if you intend to store it longer (see Notes for tips on freezing). Preheat oven to 350 degrees F (375 F if using a metal pan). Grease a standard loaf pan (9 x 5 x 3 inches). You may also want to cut out a piece of parchment paper so it fits the bottom of the pan, and line the bottom with that (to make bread removal easier). In a medium-sized mixing bowl, whisk together the flour, baking powder, salt, and sugar. Mix for at least 30 seconds to make sure all ingredients are evenly distributed. Pour beer over the flour mixture. Using a spatula, mix with a gentle folding action until well blended (with no dry patches remaining). Do not over-mix. Pour the batter into the prepared loaf pan. Melt butter in the microwave (about 30 seconds) and pour it over the bread batter. Place the bread pan on the middle rack of the oven and bake for one hour, or until interior measures about 200 degrees F (see Notes). Remove bread from the oven and allow it to cool in the pan for 5 to 10 minutes. Then turn it out of the pan and let it finish cooling on a wire rack (it tends to crumble if you cut it while still warm). Eat and enjoy. We prefer unbleached flour, and are partial to the King Arthur brand. But any decent all-purpose white flour should work fine in this recipe. For a heartier (and healthier) bread, you can substitute whole-wheat flour for up to one cup of all-purpose white flour. Almost every baking powder you’ll find on your grocery shelf is “double-acting.” It’s called double-acting because you get a first reaction (the bubbles that help cause dough to rise) when you mix the powder with wet ingredients, then a second reaction when the dough hits the heat of the oven. Baking powder does become weaker over time (and most baking powder tins have an expiration date). So replace your baking powder when necessary. I usually replace mine once a year, when daylight saving time ends (so I remember to do it). It’s a good idea to shake baking powder before using it to make sure all its components are well mixed. Baking powder consists of baking soda, plus an acidic ingredient (which reacts with the baking soda to produce leavening) and a neutral substance (usually corn starch) to provide bulk. If you don't have Kosher salt on hand, you can use plain table salt (though I’d reduce the amount by about half since table salt is finer and more “condensed” than Kosher). If this bread is too sweet for your taste, you can reduce or even eliminate the sugar. Or substitute honey. You can use just about any beer for this recipe—though as mentioned in the recipe headnote, the type you choose will affect the taste of the bread. Most of the alcohol in beer evaporates during baking—though not necessarily all. Wikipedia provides a handy chart showing how much alcohol remains after various cooking procedures. If you’d like to read more about the original study on which the Wikipedia article was based (and you have access to technical journals), check out “Alcohol retention in food preparation,” by Jorg Augustin, Evelyn Augustin, Rena L. Cutrufelli, Steven R. Hagen, & Charlene Teitzel, published in the Journal of the American Dietetic Association, April 1992, volume 92, number 4, page 486(3). If you want to make a totally non-alcoholic version of this bread, you can substitute a carbonated drink (such as plain seltzer) for beer. But this will—of course—change the flavor. You can dress this bread up with almost any flavoring that appeals to you. Popular additions include grated cheese, garlic, and herbs (such as dill). An instant-read thermometer is perfect for checking the internal temperature of almost anything you bake or cook. Most of the ones you can buy are accurate, although some may take 10 or 15 seconds to accurately record temperatures. My favorite instant-read thermometer is the Thermapen. These are accurate to less than 1 degree F, and take a reading in 3 seconds or less. The downside? They’re pricey (about $90 or so). But they’re worth it. When freezing this bread, we slice it first (because slicing frozen bread can be like sawing through a rock). We also place small squares of parchment paper between the slices to prevent them from freezing together. We double wrap the sliced bread before freezing (put it in a plastic bag, and then into a freezer bag). When ready to use, we just pull out as many slices as we want. 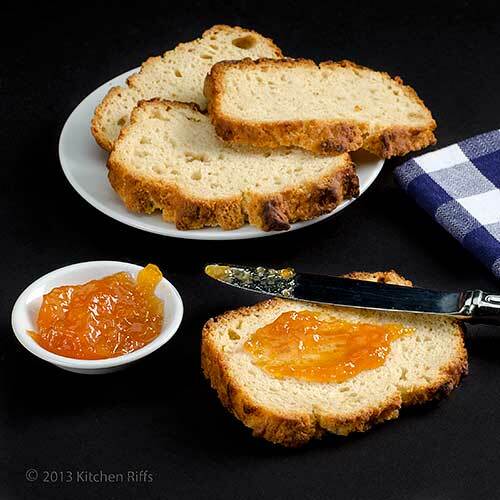 Slicing this bread is easiest with a serrated bread knife or an electric knife. “Well, I’d call this the perfect food,” said Mrs. Kitchen Riffs, picking up a hunk of Beer Bread. “They do say bread is the staff of life,” I replied, biting into a slice. “And this one contains all four major food groups—salt, fat, sugar, and alcohol,” said Mrs. K R.
That’s my kind of whole food. After reading your information I probably need to go and buy some new baking powder. This easy little recipe looks like something that would go great with a big bowl of veggie soup. Thanks to Mrs. KR for doing the research. Hi Karen, it always kills me to toss baking powder because we go through half a can a year at most, but it's really better to replace it. And this would be great with veggie soup! Thanks for the comment. I've never made beer bread and always wanted too. I guess now is the time! This looks perfect for hearty fall dinners! Hi Abbe, you really need to make this some time - so easy, and great flavor. Mrs K R doesn't like beer, and she's in love with the flavor of this! So you know you can't go wrong. ;-) Thanks for the comment. I first made beer bread over 25 years ago; soon after moving to Colorado I saw a recipe for Coors Beer Bread and took a chance. Especially since I'm not a huge beer fan. It's not only easy, it's 'I really should not have one more piece but I'm going to anyhow' good. True to the recipe I first used Coors but since then have enjoyed mixing it up with lagers, dark beer and more. All different, all good! I'm going to the fridge now...if there is a beer in there; this is gonna be made today! I LOVE beer bread....especially with soups/stews when the weather gets cold. It's the best and yours looks super tasty. Thanks for sharing! Hi Barb, it used to be me who wanted to buy beer when we went to the grocery store, now it's Mrs K R (she doesn't like beer!). This really has lovely flavor. Hope you have a beer in the fridge! Thanks for the comment. Hi Ashley, it's great with soups or stews. Or all by itself. ;-) Thanks for the comment. Hi Arthur, it really is! Thanks for the comment. There is definitely nothing better than a home made fresh bread. It's been a while since I've tasted a beer bread, forgotten how it was, I might have to get to it soon. Hi Asha, beer bread really has a nice, tangy flavor. And the more flavorful the beer, the better the bread. Worth trying again - it's really nice. Thanks for the comment. Hi John , heard of beer bread , never baked any , it's getting to comfort food weather so now is the time . I took notes on freezing tne bread , thanks to Mrs.K R and thank you for sharing . Kneading and rising are two stages that I'm afraid of when I "think" about baking bread... Ok I tried a few times, and some successful result but still I feel like the room temp is not warm enough to rise the dough...anyway one day I want to say making bread is "therapeutic" like everyone else! Meanwhile this sounds like my kind of bread that I can try baking! This sounds like an especially wonderful (and easy) recipe for when the snow flies and you cannot make it out of the driveway to go buy bread. Thanks! Hi easyfoodsmith, it really is a lot of fun - Mrs KR made another batch today! Thanks for the comment. Hi Nee, this is so easy to make, once you do, you'll wonder what took you so long. And you're right that cooler weather brings out the baker in most of us! Thanks for the comment. Hi Nami, when you make yeast bread, you can actually let it rise in the refrigerator! It just takes longer. But this sort of bread really is pretty easy. Worth making, IMO. Thanks for the comment. Hi Ina, you're right that this is one of those recipe that calls basically for pantry staples. And it's so good! Thanks for the comment. True. I seldom have beer in the house, but there are usually a few cans of pop around. I could make this into an Orange Crush or Sprite loaf... :) Do you have a recipe for that delicious looking jam? And thanks also for the instructions on how to freeze the bread. Hi Ina, we always have seltzer on hand even when we don't have beer. No recipe for the jam, alas - it's commercial. One of these days we'll do preserves, but we've resisted it thus far! Hi Gourmet Getaways, by all means blog it! In a way we all blog for each other, yes? ;-) Enjoy - it's delish. Thanks for the comment. Hi Liz, I've actually known people who bought only self-rising flour - I guess they only made biscuits or quick breads, nothing else! - so maybe they didn't realize that not all flour contained baking powder! I can imagine your bread was more that a little dense and flat. How was the flavor? And thanks for the comment. This is such a gorgeous, hearty bread, John! I love how dense it is and I bet it would go great with a big pile of freshly sliced meat. Great recipe! Hi Georgia, isn't this nice? Lovely texture and flavor. Sliced meat would be wonderful with this! Thanks for the comment. John, I could bite into a piece right now, with jam please! Great recipe, interesting, thanks for sharing. Hi Lizzy, jam goes great with this! Thanks for the comment. Hi John, I think my very first no kneading & yeast-free bread will be on this recipe! I have tried to make bread and so far the results are mixed. I can't wait to try this hassle-free recipe. Thanks for sharing! No yeast kneading or rising time? Im in!! What a fun recipe, and it looks so good! I have always wanted to make beer bread...now I have a recipe! This bread looks perfect! Hi Yi, bread is fun to make! But I've certainly had failures at it. This one is pretty straightforward. Just don't overmix, and try to wait until the bread is totally cool before you cut it (hard to resist, I know; but it tends to crumble if you cut it warm). Thanks for the comment. Hi Kriti, this really is a nice, quick loaf. And I'd bet SF's Anchor Steam beer would be terrific in this! Thanks for the comment. 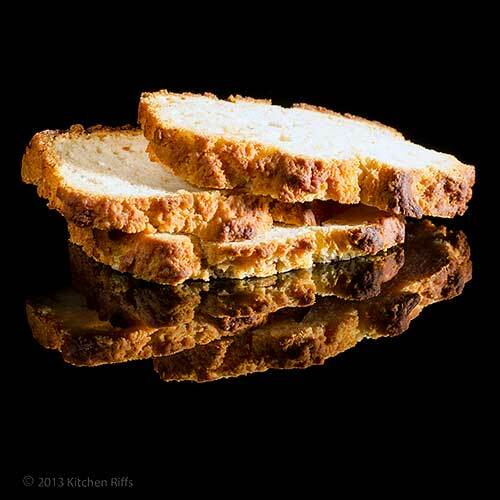 Hi Cathleen, beer bread is easy and really tasty - such a lovely flavor. Have fun! And thanks for the comment. Must smell and taste delicious. I think I’d be able to sniff out your house from all the great things you have cooking in there! I love beer bread! Especially with a bowl of soup or stew. I love your photographs John! Gorgeous! hehe....I always make bread the hard way...or should I say, the time consuming way. I'm loving your beer bread especially when I'm always in a rush and a quick bread recipe is perfect with my family's busy schedule. Thank you for sharing this gorgeous bread. Bread and beer, two of my favourite carbohydrates. Dang I should've thought of having beer bread at my 21st birthday. Oh well, there's still room for it every day to come! I'll be using this recipe for sure. Thanks, John! Beautiful and very tempting! this bread must have an interesting flavor. you had me at "no messing with yeast." :) i don't mind it so much when i have time, but i'd rather not try to rush it along if i'm in a hurry. Ha! I love this post! What a great loaf of bread. I keep saying I'm going to make beer bread (and sourdough) and I haven't done it yet. I keep going back to our favorites. This looks delicious! I am not a big fan of beer - but this bread looks amazing and I think I might fall in that category of "people who don’t like beer love Beer Bread" - the crust on this looks fabulous! Hi cquek, we usually do have pleasant aromas coming from the kitchen! And this bread smells great while baking. ;-) Thanks for the comment. Hi Anne, isn't beer bread nice? We've been baking an awful lot of it lately! Great for cooler weather - as you say, it goes well with hearty soups and such. Thanks for the kind words, and comment. Hi Amy, oh, we make plenty of yeast bread too! In fact we're making a no-knead one now that requires rising overnight. Takes time, but very little active time. The nice thing about this bread is you can have it soon after you start making it, not the next day as it is with the no-knead bread. Thanks for the comment. Hi Irina, bread & beer are two of my favorite carbs, too! This would have been perfect for a 21st birthday celebration! Of course there's always 21 years and one month, two months, etc . ;-) Thanks for the ocmment. There is something so utterly satisfying about a loaf of bread baking in the oven. Even better when it doesn't take hours and hours to make happen. Love this! Hi Rosa, it really nice have both a nice flavor and fragrance. Truly good stuff! Thanks for the comment. Hi Charlie, it really is great bread - tons of flavor. Thanks for the comment. Hi Shannon, we're OK with yeast, and do a lot of yeast-based breads. But this has different flavor and is so, so easy! Thanks for the comment. Hi Kumar, it really does make a great loaf! So flavorful. ;-) Thanks for the comment. Hi Beth, it is a great loaf! ;-) Thanks for the comment. Hi Maureen, beer bread is so easy - and so flavorful. As is sourdough, but that takes quite a bit longer, of course. But you need to try both! Thanks for the comment. Hi Shashi, Mrs K R really doesn't like beer at all - she'll maybe take a few sips of Guinness, but that's it (and by a few sips I mean well under a fluid ounce). But she loves this bread, as do I. The crust really is great - such nice color and texture! Thanks for the comment. Hi Shut Up and Cook, homemade bread is the best! The aroma alone is worth it. And this bread really is easy. And quick! Thanks for the comment. I have never made bread before, well only banana! This recipe looks amazing, if I am feeling adventurous I will be testing this out! Hi Natalie, this isn't all that different from banana bread. Although obviously there's that beer thing! But it's worth trying - truly delish. Thanks for the comment. I haven't had beer bread in forever! Now I'm craving it for sure. I've had beer bread in my head for a very long time now. This looks like a loaf i would've devoured all day. Yum! <3 beer bread, especially beer pizza & pita bread ;) The local beers in Oregon are reallly good! Hi Laura, sorry about that craving thing. ;-) Thanks for the comment. Hi Kiran, time to get it out of your head, into the oven, and onto your table! ;-) This is dangerous though - it's too easy to eat it all in one day. Thanks for the comment. Hi Veganmiam, beer pizza and pita bread sounds most excellent. And you're right that Oregon has some terrific breweries. Thanks for the comment. Hi Ala, great use for leftover beer! Actually we drink so little beer these days we have to buy beer so just we can make the bread! Thanks for the comment. This bread looks full of flavour and so easy to put together! I probably won't ever taste it but I bet it tastes good!! Hi Carolyn, yeah, she really nailed the major food groups, didn't she? ;-) Thanks for the comment. Hi Nazneen, it's wonderful. It does, alas, have a very small amount of residual alcohol, though (as does anything made with vanilla extract, BTW, although in that case it's miniscule). Thanks for the comment. I love homemade bread, eating and baking it. this sounds simple to make and I love the beer in it. I will have to put it on my list to make. Hi Dawn, this really is a simple bread, and has great flavor. We're loving it! Thanks for the comment. This looks like a great hearty bread. As the beer has yeast in it, did it rise a little whilst baking? I will have to book mark this as I can't tell you how many times we run out of bread in our house as they only come in loaves of 6 slices. It is an Asia thing...everything is minature as you have to carry it back from the market. Your loaf looks so good! So crispy on the outside and moist on the inside. I like making beer bread this time of year to go with soups and chilis. Wow, I can't believe it's that easy to make bread, no yeast or anything. Thanks for sharing a great recipe! Never heard of before, but it looks soo good, that I MUST try it. The best of all- it seems easy to prepare and and for sure- is delightful. Hi Bam, it did rise, but that was much more the action of the baking powder. Loaves of 6 slices? Great for a single person or a couple, but your boys would go through two of those loaves at a time! Thanks for the comment. Hi Debra, your English teacher was a wise person! ;-) And it's actually ind of true. There's actually some speculation that some early hunter/gatherers ceased their nomadic ways to grow grain not so much for the food, but because they could use it to brew beer! Anyway, thanks for your comment. Hi Amy, that top crust is so nice! And it's odd, we make regular bread throughout the year, but at this time of the year (the beginning of soup weather), beer bread is one of our faves. Thanks for the comment. Hi Christine, yup, it's easy! It doesn't have the texture of regular bread - it's a little bit more cake-like - but it works quite well. Thanks for the comment. Hi Daniela, this really is so easy! And so tasty. It's easy to get addicted, though. ;-) Thanks for the comment. I definitely want to try it since I never had it before. The loaf looks perfect. Thanks for sharing the recipe!! Hi Shibi, I think you'll enjoy it - it's really good. Mrs K R baked another loaf today! Thanks for the comment. Well, there goes my excuse for not baking bread John. I have such a yeastaphobia and now, I shall have to try my hand at baking Beer Bread. Marion will be thrilled! I have made a vow to her that I will bake bread at least once before next Spring! Bookmarked! Thanks for the valuable tips too. I never realized you should shake baking powder. Good to know. The freezing tips are wonderful too. I often buy Amish bread and store it in the freezer. It never occurred to me to put parchment paper between the slices. GREAT! btw, i jad once made a black bavarian beer bread, it's had a hillarious smell..
Hi Louise, always happy to break bread with you and Marion! And once you make this bread, you'll wonder why you haven't before - it's truly easy. Great flavor, too. It doesn't replace a good yeast bread, but it's a nice change. Thanks for the comment. Hi Greg, LOL! That'd be an awesome combo. Thanks for the comment. Hi dentistvschef, isn't this a nice looking bread? Really tasty, too. Thanks for the comment. One of my daughter's friends convinced me to make this bread a few years ago. You are completely right. The aroma as it bakes is wonderful, and the bread comes out light and tender. Best yet, no kneading involved! Hi Kristi, isn't beer bread nice? Dangerous, though - so easy to eat too much! Thanks for the comment. What a great idea to use beer instead of water when making bread. I have to try that with my gluten-free recipe. You have such a great crust on that loaf. Hi Suzanne, I'll bet this work would well with your gluten-free recipe! Thanks for the comment. And imagine varying the beers....(I've made some with guiness - great too)! Thank the MIssus, she done good! Hi Kitchen Butterfly, the Missus is definitely a keeper! ;-) Guinness is great in this. And it's fun to vary the beers - you can definitely change the flavor of the bread by doing that. Thanks for the comment. Just checked Tastespotting to look for an easy bread recipe and came across your beer bread. I made a huge pot of chili yesterday to enjoy tonight (it always tastes better the second day! )and this will go wonderfully with it. I'm going to mix in some fresh chives and oregano from my garden - we'll see how that goes! Turning the oven on now! Hi Anonymous, we're having chili tonight, too! And Mrs KR just baked up another batch of this bread - it's cooling right now! And the aroma is driving me nuts. ;-) Hope you enjoy this, and thanks for the comment. How did I miss this?! When I first looked at the loaf, I thought it was a yeast bread. Quite surprised to see that it's a quick bread. I've never added beer to bread, but it does sound good AND LOOKS delicious! Now to get Bobby to give up one of his beers. :) Great bread recipe John! Thanks! Hi MJ, once Bobby tastes this bread he'll gladly give up one of his beers. Of course, he'll probably start buying extra! Mrs KR, who's not a beer drinker, has actually been suggesting we go out and buy beer so we can make this bread. ;-) Thanks for the comment. Hi Raymund, this bread is really good - definitely worth a try. Particularly if you like beer. ;-) Thanks for the comment. Hi Terra, we had this with chili last night. ;-) It was terrific! Thanks for the comment. Hi John, your quick beer bread look so delightful. The texture is soft and fluffy, very well baked. Interesting recipe, thanks for sharing. Regards. Hi Amelia, it's really a nice recipe when you want a lot of flavor and don't have the time to make a yeast bread. Besides, beer has such a terrific aroma when baked in this bread! Thanks for the comment.